Shameel is from the Maldivian capital, Male. Shameel has spent the last couple of years researching whale sharks with our friends at the Maldives Whale Shark Research Programme (MWSRP) . He was a key member in carrying out the in-field research operation, as well as the community initiatives, such as the Maldives Whale Shark Festival. After spending a year abroad in the UK to complete a foundation year in science, he is looking to complete his undergraduate degree in the next couple of years, either in the Maldives or abroad. 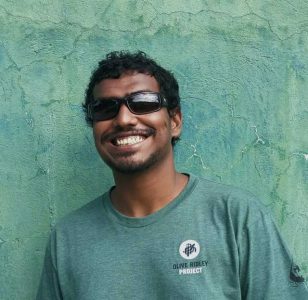 In the meantime, he has joined the Olive Ridley Project to work as a Project Coordinator as we look to reach out to more fishers and island communities and maintain a consistent presence in the Maldives.